After the controversy caused by the news analysis by Stockwell in 2016 "Do "Moderate" Drinkers Have Reduced Mortality Risk? A Systematic Review and Meta-Analysis of Alcohol Consumption and All-Cause Mortality" it was inevitable that more research in this subject would be started. The systematic review and meta-regression analysis of studies investigating alcohol use and mortality risk after controlling for quality-related study characteristics was conducted in a population of 3,998,626 individuals, among whom 367,103 deaths were recorded. A total of 87 studies were examined and the paper concluded that when his team corrected for abstainer "biases" and certain other study-design issues, moderate drinkers no longer showed a longevity advantage. Stockwell's paper concluded that "Estimates of mortality risk from alcohol are significantly altered by study design and characteristics. 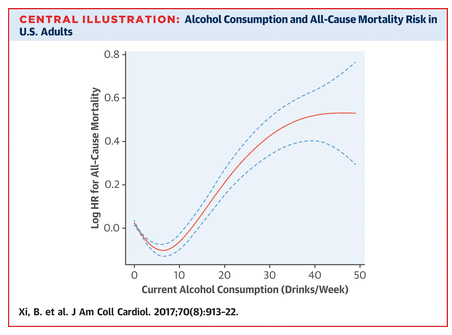 Meta-analyses adjusting for these factors find that low-volume alcohol consumption has no net mortality benefit compared with lifetime abstention or occasional drinking. These findings have implications for public policy, the formulation of low-risk drinking guidelines, and future research on alcohol and health. A blog by The Stats Guy relating to the subsequent change to the U.K.'s alcohol drinking limits is enlightening and gives an indication that Stockwell and others like the Sheffield group may have been overzealous on their interpretations of data. Stockwell's view was contrary to the previous large meta-analysis by Di Castelnuovo et al in 2006 "Alcohol dosing and total mortality in men and women: an updated meta-analysis of 34 prospective studies". Di Castelnuovo used a meta analysis technique where the results of 34 studies were collated and reviewed and published in the Archives of Internal Medicine. The study looked at the link between the amount of alcohol drunk and death rates in men & women in clinical trials conducted before the end of 2005 with over 1 million subjects. A J-shaped relationship between alcohol and total mortality was confirmed in both men and women. Consumption of alcohol, up to 4 drinks per day in men and 2 drinks per day in women, was inversely associated with total mortality or the chance of dying, maximum protection being 18% in women and 17% in men. Higher consumption of alcohol was detrimental. The results were consistent with studies by other research including Sir Richard Doll's 1994 study "Mortality in relation to consumption of alcohol: 13 years' observations on male British doctors". Now a brand new study published aimed to tackle the controverisal issue of wine and health yet again. In mid-August 2017, a new and large study was published in the Journal of the American College of Cardiology, "Relationship of Alcohol Consumption to All-Cause, Cardiovascular, and Cancer-Related Mortality in U.S. Adults" by Bo Xi, Sreenivas P. et al. The study in 333,247 people found that light-to-moderate drinkers (less than 14 drinks in men and 7 drinks in women) did have a lower risk of dying from cardiovascular disease. Individuals were followed between 1997 and 2009 and around 34,000 died sometime during this period. Throughout the length of the study, 34,754 participants died from all-causes. Of these, 8,947 deaths were cardiovascular disease-specific (6,944 heart disease-related and 2,003 cerebrovascular-related deaths) and 8,427 mortalities were cancer-specific. The results of the study showed that men and women who were moderate drinkers had a 13 percent and 25 percent decreased risk of all-cause mortality, and 21 and 34 percent decreased risk of cardiovascular disease mortality, respectively. Men who are heavy drinkers have a 25 percent increased risk of mortality due to all-causes and a 67 percent increase in mortality from cancer; however, these results were not significant in women. There were similar findings for light drinking for both men and women. This is the key point. Bo Xi and his team were careful to address the supposed flaws in previous studies on alcohol and health. So the non-drinker group only included lifetime nondrinkers, so "sick quitters", former heavy drinkers and those who gave up alcohol because they got sick were excluded. The paper also controls for smoking, Body Mass Index (BMI) and physical activity, Some academics still believe that total lifetime abstainers are rare and could share other, unforeseen traits that impact their health, whereas moderate drinkers might have an overall healthier lifestyle. Causation is almost impossible to identify and this will always be a flaw. But this new observational study tries its hardest to be large, well designed and lasted for 12 years. A new study costing $100 million by the U.S. based National Institutes of Health will aim to finally answer the question whether daily alcohol drinking can help lower your risk for heart attacks, strokes and death. 8,000 volunteers will be recruited that fit very specific criteria from 16 areas around the world. Half will randomly be selected to have one drink per day, while the other half will have to abstain from drinking during the course of the study. These two groups will be followed for six years (poor abstainers!). The clinical trial will be run by notable researchers from around the world in Boston, Baltimore, Amsterdam, Copenhagen and Barcelona to cover all regions of the world.